So, Mark Sepinuck at 10MFAN mouthpieces sent me a couple of his mouthpieces to try. Today, I am checking out the hard rubber Robusto model. 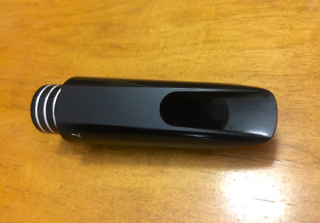 Mark designed this mouthpiece for his own personal, daily used mouthpiece. 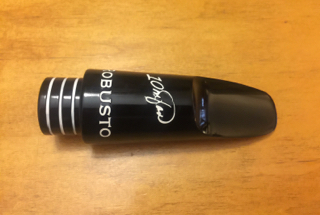 He wanted to make a mouthpiece that embodied the sounds of people such as Gene Ammons and Dexter Gordon and I believe he did just that…and more. I put this mouthpiece through it’s paces in the (extended) video at the end. Now for some specs. 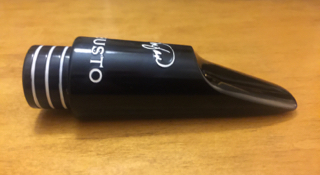 The chamber on the Robusto is a medium large chamber, as it is with all 10MFAN tenor mouthpieces. I put a D’Addario 2 Hard unfiled reed on it and got a contemporary sound out of it, but I feel like I could very easily switch to a stiffer reed and darken it up a little bit. In fact, the sound clips on the 10MFAN website really put that on display. The Robusto doesn’t mind being pushed either. It can take all the air you give it. My sound was warm when I subtoned or played a soft to medium volume, but when I started putting more air through it, it responded by brightening up and projecting nicely. This mouthpiece seems very versatile to me. The facing on it is long. Mark worked with Eric Falcon, and together through some pretty intensive testing, they came up with the current specs. The Baffle is what Mark calls a flat baffle, but when you look inside, you can see there is some concave happening on the way into the chamber. This is one of the reasons I put a soft reed on it. I tend to sound like a chainsaw when I use a stiffer reed on anything but a rollover baffle. The rails are nice and thin and the tip is precise as well. I played a few reeds on it and they all played. 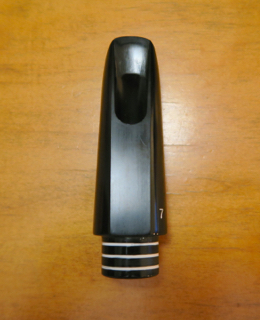 Just make sure to align the reed to the very tip of the mouthpiece. It does make a difference. Mark sent the Robusto with a Berg Larsen ligature, but I was able to find a few different ligatures in various price ranges to fit it. The Rice (D’Addario) H ligature, The Francois Louis Ultimate XL tenor Brass, and the Silverstein all fit. I’m sure there are more as well. Basically, I really like this mouthpiece. I am a rollover baffle kind of guy, so I was skeptical of the sound I would get, but I was pleasantly surprised. I also like how versatile this mouthpiece is. I end up doing a lot of different work and playing a lot of different genres, so I demand a lot out of a mouthpiece. I would feel comfortable taking the Robusto on any job I do. The more I played it, and warmed into it, the more I enjoyed it. If you’re interested in hard rubber mouthpieces, you should give this a try. I think Mark did a great job. I guess you could call me a 10MFAN. (insert groan). So check out the video. I probably played too long, but as I said, I was having fun. Big thanks to my friend Steve Johnson at Virtuosity for the floor space. This entry was posted in Mouthpiece Reviews and play tests. Bookmark the permalink. Trackbacks are closed, but you can post a comment. Want to learn the sax? Whether you're a beginner or just looking for some tips on saxophone mastery, Jim can help you reach your goals. Fast cars, old school skateboarding and playing the sax have shaped the person Jim is today. Copyright © 2012 James Calandrella. All Rights Reserved.